Cancer has become one of the leading causes of death for dogs and cats, who are living longer than ever thanks to progression in veterinary care. 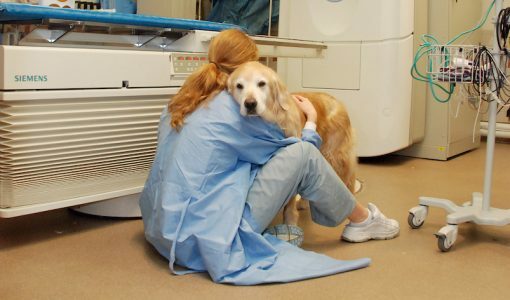 As more and more pets are receiving treatment for cancer, treatments are ever-improving. 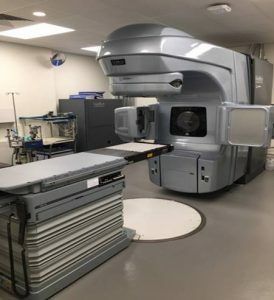 To offer the most advanced care available for pets with cancer, a new, state-of-the-art Varian linear accelerator has been installed at Cummings Veterinary Medical Center, and the Radiation Oncology Service reopened to clients on September 24, 2018. 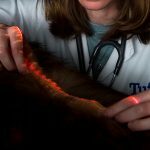 Radiation therapy is an important tool in fighting various cancers in both human and veterinary medicine. Utilized alone or in conjunction with surgery and chemotherapy, a tumor may be completely eradicated by radiation therapy in some pets. In other pets, the cancer or lump may never completely disappear, but growth is slowed or stopped and the tumor is essentially controlled for a period of time. Treatments can also palliate clinical symptoms of cancer, thereby improving a pet’s quality of life. Radiation fights cancer by damaging the DNA in cancer cells, destroying the cancer’s ability to reproduce. While both normal cells and cancer cells are affected by radiation therapy, the treatment is designed to maximize damage to tumor cells while minimizing effects to the surrounding normal tissues. The Center’s sophisticated linear accelerator and advanced treatment planning technologies allow precise tumor localization via built-in advanced imaging and the ability to deliver precisely-sculpted 3D dose distribution. It produces both high energy x-rays for the treatment of deep-seated tumors or electron beams for the treatment of superficial tumors. 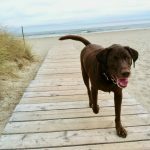 With treatment delivered by specialists in radiation oncology and support from many ancillary services, Cummings Veterinary Medical Center’s team of experts have the training, equipment, and compassion to give your pet the best chance. 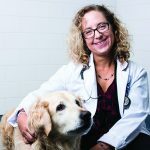 A board-certified specialist in Radiation Oncology, Dr. Michele Keyerleber commonly treats tumors in dogs, cats, and other species at Foster Hospital for Small Animals. Her research interests and clinical trials include palliative radiation therapy, cancer pain and radiation side effect management, radiation therapy treatment planning, and more. 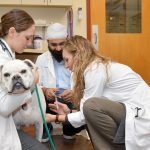 Dr. Keyerleber obtained her veterinary degree at the Cornell University College of Veterinary Medicine, where she also later completed a residency in radiation oncology. 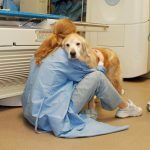 The mission of the Harrington Oncology Program is to provide the highest quality care for companion animals with cancer. This is accomplished by integrating state-of-the-art diagnostic, medical, radiation therapy and surgical techniques.